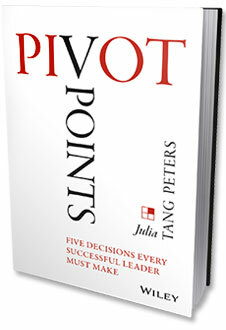 Julia Tang Peter’s clients achieve their goals and derive lasting benefits. Without exception, clients report that Julia exceeded their expectations, allowing her to enjoy long-term relationships with executives and client organizations — an important measure of her effectiveness. Coached executive for 8 months on including development of strategic plan, crafting and delivering presentations, and gaining the organization’s support. Executive progressively increased utilization of the coaching process to help him be more effective in leading the business, people and process. Senior management approved the strategic plan, his team supported the plan, and financial targets were met. Executive was promoted to lead a larger functional unit.